Whiskies so often seem to reflect their creator. Bruichladdich whiskies display the passion and local ethos displayed by Jim McEwan. Variously finished Glenmorangie drams showcase that experimentation possessed by scientist Dr Bill Lumsden. Whiskies made at the Old Hobart Distillery, much like their creator, Casey Overeem, have true character. And much like Casey, this character is very likeable. 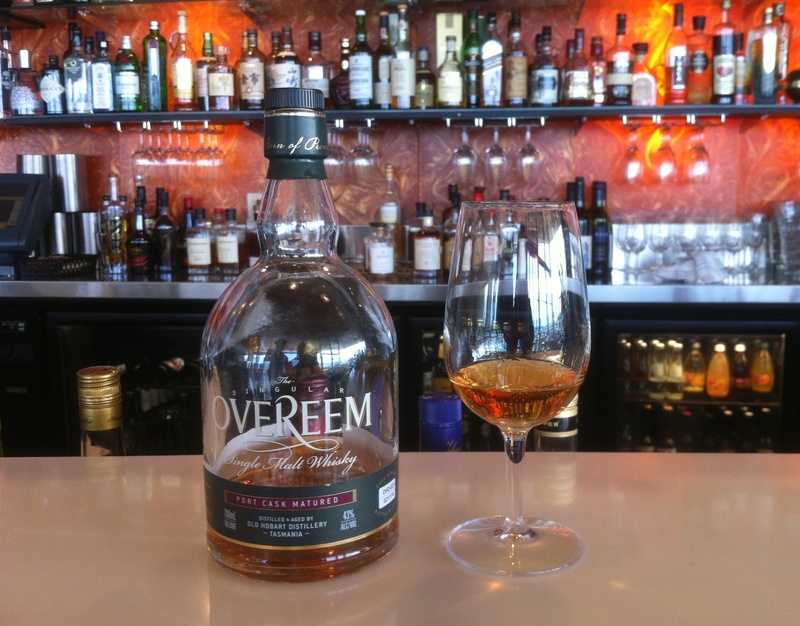 Old Hobart Distillery releases their whisky under the label ‘Overeem’ and is part of a growing collective of whisky makers from southern Tasmania consistently churning out a high standard of products. Overeem, like Lark and Sullivan’s Cove, use French Oak ex-port barrels cut down to 100 litres to mature a percentage of their whisky. The flavours created by this process, similarly to its contemporaries, are equally extraordinary. But there’s something a little extra special about the Overeem. It has an element of ‘handmade’ about it, something that suggests this whisky is crafted instead of distilled. The nose is light but enticing. There are notes of berries and stewed apricots alongside faint traces of ginger and fennel. There are also some gloriously Tasmanian woody notes which call to mind a home-workshop stocked with Huon Pine. The palate is richly flavoursome and offers many layers to discover. It is initially sweet and spicy, offering fizzy orange sherbet notes with a dash of pepper preventing it from becoming too sweet. There is also a degree of citrus and maltiness, combining to give the impression of a freshly baked sponge cake with lemon curd. The finish is lengthy and contains faint raisiny and caramel notes: finally, the much-vaunted fruitcake has made a subtle appearance! This is a fantastic example of a Tasmanian Whisky in more ways than just flavour. It is the perfect illustration of a micro-distillery whose focus is on creating a well-crafted product. This is not done simply as a business venture, but instead as a way for one man to create the spirit that he loves. And Casey Overeem’s intent is certainly apparent when drinking the whisky which bears his name. ← Whisky Waffle Present: Whisky World! I have sadly yet to try an Overeem whisky and it has been one of my regrets considering that I spent a good 5 years of my life in Melbourne and didn’t even bother. However, I can honestly say that reading this review made my mouth water quite a bit and I definitely know what I will be going for when I return to Melbourne later this year. Brilliant review as always Nick! You’re returning to Melbourne later this year? When will you be around? Good old Whisky & Alement on Russell St should stock a bottle or two of this one! I’m intending to visit sometime in early July, but have yet to confirm my travel plans. However, I will most definitely be in Melbourne in early October for a week at the very least. My taste buds are being tantalized by your eloquent description of this whisky! Ha ha, and so they should be! It’s a particularly nice one! I am sure that the market for old port barrels has gone through the roof. I suspect it was the ‘wait time’ to get the spirit to the market that put these Tassie blokes onto smaller port barrels Nant, Overeem and Sullivans Cove all impressed me with their Port finishes about 3 years ago. All soft sweet but not overpoweringly fruitcake that a sherry barrel can bestow on whatever comes its way. A rare whisky that at cask strength lets all of its flavours out delicious. I’d love to get my hands on some of the cask strength! I’ll probably have to wait a while. Plus I’m interested to see what the new wave of Overeem (and Sullivans Cove for that matter) is going to be like! Cheers for the comment, I completely agree! Casey Overeem is my very dear uncle. Your description of his whisky made me a little teary. My grandfather (Casey’s dad), a right dear, loveable man, had an amazing wood workshop that I loved to be in, by his side, with the delicious rich, warm scents of Tassie timbers roughly hewn, Huon Pine being my favourite. If you have caught that fragrance in Casey’s whiskey, you’ve caught something inherent to being Overeem. Thank you very much for the comment. I guess it’s a very subjective tasting note, but that’s what it made me think of! How wonderful that it also resonates with you! It’s a very special whisky, and for more reasons than just the flavour.